A remix album that surpasses the original recording is a rarity indeed. For a relatively small scale, indie electronic band like Ultraista it feels perfunctory to issue one at some point and along with contemporaries such as Au Revoir Simone and Lali Puna, as well as big hitters like Bjork and Lady Gaga, the thing they all have in common is wildly varying levels of success and are all too often the ultimate exercise in self- indulgence. 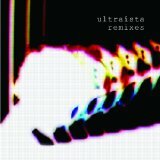 Ultraista’s self-titled album, from which the remixers all derive their source material, was released last October and considering the enticing concept of Thom Yorke’s right hand man, Nigel Godrich, making female vocal lead electronica, the actual reception was not entirely ecstatic. It was glitchy and introverted, not necessarily intended on occasion I’m sure and partly due to Laura Bettinson’s vocals often being quietly pushed back into the mix, which undermined the impact of some of the stronger melodies. The main problem of what is still an interesting and thoughtful album is that, apart for the trip (predominantly) hop of slowed down “Party Line”, it was an album with little variation of beat, rhythm or structure. This album then is the ideal companion piece, bringing out the necessary colour and bite. All ten of the original songs get a new treatment and unlike many other remix excursions there aren’t six versions of one particular track leading to repetitive ear strain injury early on (there are additional versions on the digital version though), with the majority thankfully not exceeding the five minute mark. “Smalltalk (Four Tet)” may stutter and rattle enthusiastically but the melody which was previously implied but not exploited now shines through and “Party Line(Canon Blue)” brings Bettinson’s vocal out of hiding and makes it a tight, bright thrill; the same applies to the now delightfully menacing “Easier (Zammuto)”. “Static Light”, always one of their strongest tracks, was originally swamped by synths and drones and now Matthew Herbert turns it into a buzzing, tumbling pop rush reminiscent of his more major production work with Bjork and Roisin Murphy. Oddly now becoming better known as a prolific remixer (how exactly did this happen?) than a film director, David Lynch brilliantly turns the averagely competent “Strange Formula” into a dusty and scuzzy blues drawl. “Bad Insect” and “Our Song” don’t fare as well, being overwrought drum and bass and blissed out coffee table respectively, but two out of ten ain’t bad. In many ways a template for the successful remix project, Ultraista have proved that there is still life in what is a really a marketing tool if quality control is paramount and the DNA of the original material remains; this is certainly the case here. This collection is cohesive and thoughtfully complied and if it in fact had been released in this format, it might have succeeded in making a stronger impression than the original recordings themselves. As it stands, the remixers have done an exceptional job in exposing Ultraista as the dynamic, quietly foreboding band that they have the potential to be.